Cronograma de un Tiempo Inexistente (Chronogram of Inexistent Time) is a film and video installation consisting of multiple projections onto layered asymmetrical surfaces. This intricate, hybrid work is constructed from 35mm and 16mm film, as well as analogue and digital video images which have been hand-processed, re-photographed and digitally manipulated. The work examines the architectural possibilities of ephemeral images, their displacement and the traces that they leave behind repetition, memory and time. 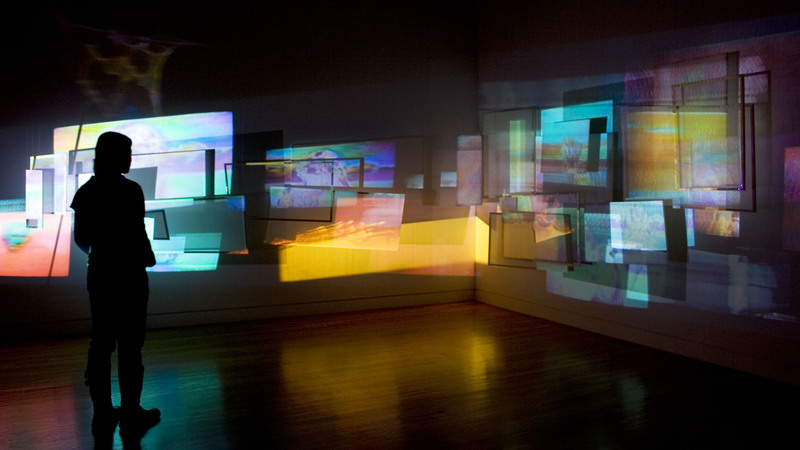 Szlam developed the work using a 35mm still film camera to re-photograph sequences of recognizable films while they played on a television monitor from VHS tapes. These images were composed and edited in-camera to create frameless sequences on filmstrips. This process and subsequent creation of large-scale photomontages led to a continually evolving series of images from the same source material. When projected these strips become a collage of non-linear, non-synchronized visual compositions exploring stillness and motion. The shifting angles and perspectives allow the viewer to experience space through Szlam’s fragmented poetic vision. The results of this process are projected onto a collection of protruding canvases and frames, layered and mounted at various angles on two of the conjoining walls in the gallery space. These architectural elements further fragment and modulate the projections. Coupled with this intervention in the physical space, the ephemeral quality of the projected images their transparency, layering and repetition suggest both loss and renewal. This malleable reconstitution of what is visible and invisible invites us to reflect on the role memory plays in our perception, the way in which we mentally reconfigure fragments to conform to our own experience and attempt to construct stability and meaning in an environment of perpetual flux. MALENA SZLAM is a Chilean born visual artist and filmmaker. She is an active member of Montral’s Double Negative Collective, a group of film, video and installation artists interested in creating, curating and disseminating Canadian and international experimental cinema. Her work has been screened in North America, Mexico, France, Italy and South Korea including: aluCine Latin Film and Media Arts Festival (Toronto), the Festival International du Film sur l’Art (Montral), EXiS Experimental Film and Video Festival (Seoul), Centre Europeen d’Actions Artistiques Contemporaines (Strasbourg), and Views from the Avant-Garde at the New York Film Festival (NYC). Her installations have been presented at the National Museum of Fine Arts (Chile), and at Leonard and Bina Ellen Art Gallery (Montreal). Szlam currently resides in Montral, where she is the co-director of CinemaSpace at the Segal Centre for Performing Arts. Check out MALENA SZLAM’s interview with TALI DULIN from ArtSync during the opening of the 24th Images Festival.